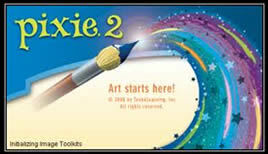 Pixie 2 software is available on our lab machines. Over the past month I’ve seen some creative teachers use the software to help students learn. The results have been terrific, and teachers and students are enjoying using this Cool Tool for learning. Pixie 2 is software made simple. A user can open the program, experiment with familiar drawing/painting tools and create! Stamps right within the program provide opportunities for those of us with limited drawing ability to create and express ourselves visually in spite of it. This opens the door for a world of writing possibilities. The ease of publishing Pixie 2 creations with Google Docs and a blog helps create a 21st Century Learning environment that extends the walls of the classroom and encourages higher quality work that is published for an audience. The best way to take a peek is to take a look at a VoiceThread created with samples of the work and comments. You can also view some of the project featured by clicking on the links below.